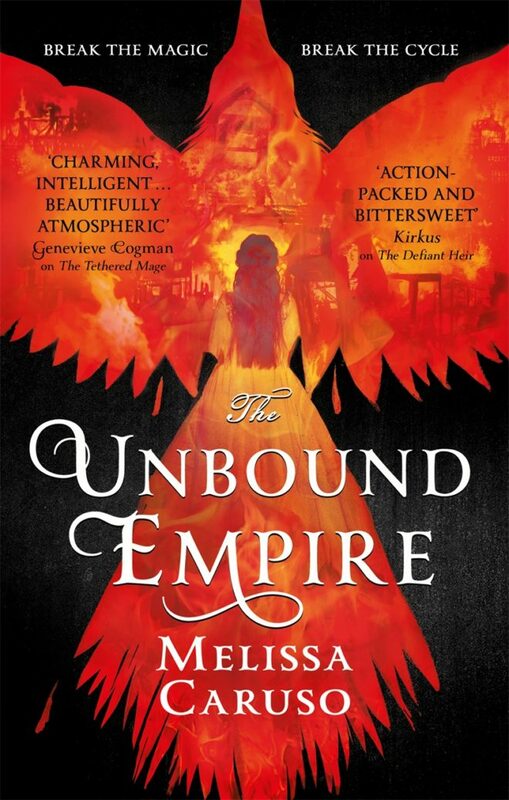 The Unbound Empire is the epic finale to the spellbinding tale of courtly intrigue and dangerous magic that began with The Tethered Mage and The Defiant Heir. I had expected the prison to be darker. But the corridor down which the guard led me was awash with brilliant light. Luminaries blazed in unadorned brackets all down the white stone hallway, which someone had swept and scrubbed spotlessly clean. A line of stout doors bore intricate artifice wards graven in broad scarlet circles above iron bars and locks. Each one represented a life sealed neatly away, bound in metal and magic. Horrified pity stirred in my chest as I thought of the people behind those doors, locked away from fresh air and human company. I reminded myself that these cells held only Raverra’s most dangerous and irredeemable criminals: traitors, murderers, and renegade mages who turned their powers deliberately against the innocent. Or, in some cases, all three. Like the man I’d come to visit. Still, my stomach lurched as the guard stopped before a door two-thirds of the way down the corridor. She gave me a wide-eyed backward glance that told me she knew full well who my mother was, and what would happen to her if this visit went wrong. I nodded, curling my hands closed to hide the sweat on my palms. He had no power to harm me, now. If this was a trap, it was a desperate and foolish one. And if it wasn’t, I wanted to hear what he had to say. The guard placed her palm on the seal, which flared with vivid red light. She turned a key, lifted a bar, and, with her hand near her pistol, opened the door. It revealed a dim box of layered darkness, disconcerting after the brightness of the corridor. I clutched the lace of my cuffs and tried to piece out shapes from the shadows. “Don’t they give you any light?” The words burst out before I could stop them. “I prefer it this way,” came a too-familiar voice, rough with disuse or emotion. Details emerged as my eyes adjusted: the blocky shapes of a writing desk, a chest of drawers, a bed. A slit window, thin as my arm, showed a narrow slice of night sky and a meager handful of stars. And there, in the farthest corner on the edge of the bed, slouched the lean shadow of a man. Ignazio. My mother’s cousin. Once powerful and respected, the former Serene Envoy to Ardence. My family, my mentor—and the man who had, on various occasions, poisoned, kidnapped, and attempted to murder me. The cramped room smelled faintly of sweat and wine. I couldn’t bring myself to step inside, even with the guard hovering protectively beside me. Ignazio had always been so neat and meticulous, with his sober dark velvet coats and spotless lace collars. His voice had been smooth and controlled, sometimes lightly mocking. Four months in prison had changed him—or perhaps it had all happened in that one moment when his careful schemes collapsed, bringing his life down in ruins around him. Memories of him warred with this sour collection of shadows: Ignazio, presenting me with my first magical theory text, his eyes sparkling benignly. Ignazio, watching me with aloof regret as I lay dying of the poison he’d given me ten years before. I failed to suppress a shudder. “Why do you prefer the darkness?” I asked. “Yes. You said you had information.” I tried to make my voice a crisp blank page, untouched by the history of pain between us, but it crumbled at the edges like an old letter. The guilt that stabbed me was the sort of cut only family could inflict, no less deep for its lack of justice. “You tried to kill me,” I reminded us both. “If you want to negotiate your release, why are you talking to me, and not my mother?” I asked sharply. He went still. For a moment, his breath rustled the darkness around him. “Then tell me what this great important mystery is, that you’ve somehow learned while locked in prison.” I folded my arms, which not so coincidentally brought my hand closer to my flare locket, ready to unleash its blinding flash if he made any sudden moves. He was stalling. He had nothing, and this was a trap after all. The name dropped into my mind like a black stone down a dark well. “That’s not possible,” I protested. But the slit of a window drew my gaze, and I knew it was. Ruven had passed messages with seagulls before, to Istrella in her tower when she’d fallen under the control of his poison. The smallest opening would suffice when birds and rats and insects could all be Ruven’s agents. “You are too apt a student of magical science to believe in the impossible,” Ignazio said. “I’ll pass along your offer. You’d best actually have something good, though,” I warned him. I couldn’t quite bring myself to wish him the same, even for politeness’s sake. I gave a curt nod and turned to go. The guard, avoiding my gaze, caught the door to close it. The heavy door closed between us. The guard slid bolts and bars into place, and the seal carved into the door flared briefly with reddish light. The guard escorted me through narrow corridors, past more locked doors. It was unsettling to think a human being lived behind each graven seal, a life full of thoughts and dreams that the Empire had deemed too dangerous to allow the simple grace of freedom. It was easy to think Ignazio deserved it; setting aside what he’d done to me, he’d also kept kidnapped children in a lightless drain and threatened a city with destruction to advance his own political fortunes. In theory, only such terrible crimes were supposed to earn imprisonment in a sealed cell. But I knew too much about the workings of power to presume that not one silenced voice behind those sturdy doors was innocent. We passed through double sets of guarded, artifice-sealed doors and reemerged into the administrative wing. As I crossed the grand entry hall on my way out—a stern, soaring space of unadorned white marble, dominated by a single statue of the Grace of Majesty with a set of scales and a forbidding expression—Ignazio’s warning gnawed at me. Ruven was dangerous enough when we knew exactly what he was planning. If we couldn’t discern his move before he made it, we might fail to block a crippling stroke. I glanced up and found myself face‑to‑face with Lord Caulin, the doge’s secret liaison with the imperial assassins and the criminal underworld, and the newest member of the Council of Nine. His slight build, mild expression, and unassuming posture made him easy to overlook, but it was perilous to underestimate him. The tilt of his head invited more information. I hesitated. I needed to bring Ignazio’s offer before the Council, and I could think of no reason to hide it from Caulin, but I didn’t trust him. “I am always on the side of the people of the Serene Empire,” I said. He meant my proposed act to end the forced conscription of mages, into which I’d been pouring countless hours and every crumb of political influence I had. Attempts at lawmaking shouldn’t have stung, coming from a man who’d never tried to pen a law in his life, but it set my teeth on edge. I drew in a sharp breath. He still smiled, his demeanor mild and affable except for those eyes full of old death. But I knew whom he meant: Marcello, my Ardentine scholar friends, perhaps even Istrella or Zaira. He could have them killed, if he chose, and no one would ever trace it back to him; that was his job, after all. I’d known this was coming. It was inevitable, now that I was taking my place on the stage of Raverran politics. My friends would be in danger so long as my enemies saw them as weaknesses. “Is that so?” Caulin asked, all innocent curiosity. Once, he might have successfully intimidated me. But I had made the choice to kill my own cousin to save others, when I held the terrible destructive power of Mount Whitecrown beneath my hand; whatever soft spots remained in me had been blasted away in the volcano’s fire. He lifted his eyebrows, affecting an expression of mild concern, and said nothing. But those black eyes analyzed me. The absolute certainty of it hummed angrily in my pulse and resonated in my voice. It didn’t matter that Caulin outranked me, or that I was only an heir with little power of my own. I would find a way. And Caulin heard it. He regarded me awhile, considering, as if I were a difficult passage he was translating from Ancient Ostan. I drew in a breath to tell him exactly how much consideration I’d given to the impact this law could have: The nights lying awake wondering if I was going too far, or not nearly far enough. The long discussions with my friends at the Mews over what it might mean for the safety of mage-marked children and the people around them. The hours poring through history books, analyzing the forces at play, the pendulum swing of action and reaction that had rocked the ships of nations since long before the Serene Empire existed. But before I could utter a word, the echoing patter of running footsteps sounded in the broad marble hall. The ragged urgency of the sound pierced my chest with a thin sliver of alarm; after two months home safe in Raverra, my nerves still expected danger in every sudden motion, every sharp word. The guard who’d conducted me through the prison halls ran toward us, her eyes wide, gasping for breath. Melissa Caruso graduated with honours in Creative Writing from Brown University and holds an MFA in Fiction from University of Massachusetts – Amherst.